The gites, L'Hérisson and La Mouette have been sympathetically converted from an old barn into two spacious, light and airy, stylish apartments. Privately situated at the end of the owner's property you will have the privacy and peace one seeks on holiday. But if you need any local information or have run out of wine, the owners are on hand! The gites have been decorated in lovely calm Farrow & Ball colours and beds are dressed in white linen with a touch of colour. Surrounded by fruit trees and shrubs and facing avenues of pine trees there is plenty of space in the gardens for playing or relaxing. We have boule sets to get you into the French way of life and bicycles for you to see the local area. Walking and cycling routes are supplied and hammocks are hung in a shady spot for that all important siesta. Otherwise, life is very peaceful lazing by the 10 x 4m salt water pool with a cool glass of local white wine. Both gîtes have a terrace with an eating out and barbecue area from where wildlife such as deer, red squirels, woodpeckers and hoopoos can be spotted. You may be too late to shop on your arrival day so we are happy to stock the fridge for you before your arrival. Just let us know in advance. Dinner delivered to your door has become really popular with guests. If you are arriving late from the channel ports or airports or have been out touring all day, we are happy to prepare a 3 course dinner or simple supper, using fresh local ingredients and served to you in your gite. Either eat in by candlelight or on the terrace in the warm evening air. Please give us 24 hours notice or book ahead. Barbeques have also been very popular here - let us take the heat out of your evening and provide a feast of barbequed food and salads for you and your family and friends. 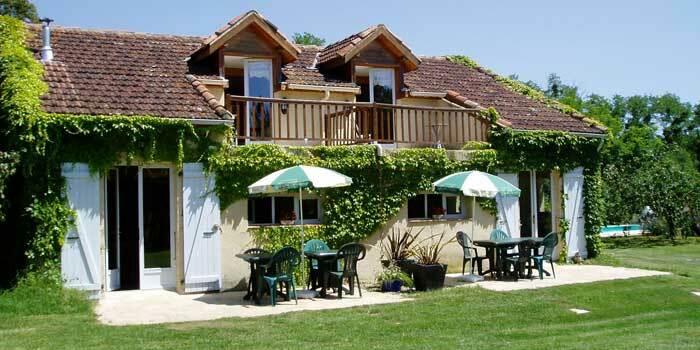 LA MOUETTE is the larger of the two gites with 2 bedrooms and a sofabed so will accommodate up to 6 people. On the mezzanine floor you will find a comfortable double bed with bathroom. The sitting area has a futon for relaxing or reading with french doors leading onto the balcony, where you can sit out. On the ground floor there is a twin bedded room and shower room. The open plan living area consists of a sitting room with sofabed, dining area and TV watching area. To rustle up delicacies from our local market there is a fully equipped kitchen with electric cooker, dishwasher, fridge and microwave. A wood burner & electric radiators will keep you warm in winter. 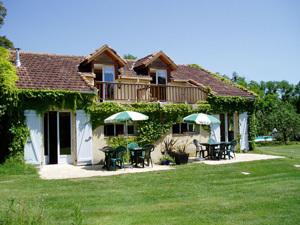 L'HERISSON is our smaller, romantic gite for 2 people, but with a sofabed will sleep 4. The mezzanine floor has a pretty large double bed with a lovely old French cot (sofa) and french doors to the balcony where you can take your coffee and even see the Pyrénées on a clear day. On the ground floor you have the shower room, the open plan sitting room with sofabed, dining area and TV watching area. 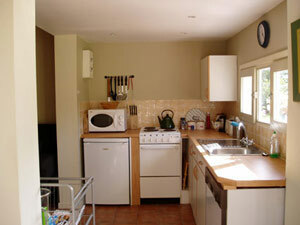 The gite has a compact fully equipped kitchen with gas cooker, fridge and microwave. To take the chill off an electric wood fire provides winter warmth. Both gites have Satellite TV and Wifi access.